Those of Nurgle's Champions who can cast spells are able to use the special Spells of Nurgle described below. Great Unclean Ones and Plaguebearers can also cast these spells, and they may be gained in other ways as decribed later. The Stench of Nurgle can only be used if the caster is engaged in hand-to-hand fighting, and it affects the nearest enemy model. A normal magic save is allowed to see if the spell takes effect. A target affected by the spell exudes a noxious smell of decay. This is so bad that all models within 6" of the target are almost overpowered by the stink, and they are unable to strike blows in subsequent rounds of hand-to-hand combat. However, they may defend themselves as normal. Only Daemons, Champions and Beastmen of Nurgle are unaffected by the odour. The affected model may be slain as a casualty during subsequent fighting. If the model is a rank-and-file trooper, casualties should be randomised among those troops fighting to determine whether he is slain. If the model is a Hero then his combat is worked out separately as normal. Once slain, the smelly character has no further effect. The Champion of Tzeentch hacked his way viciously towards his sworn blood-enemy, axe rising and falling atop a sea of bloody destruction. Over the waves of weapons and blood-spray he could see the Wizard Champion of Nurgle on the low hill ahead. Hatred filled his heart with fire and bitterness, and he redoubled his efforts, forging through the surging mass of warriors between them. His axe became a blur of motion, bodies and limbs tumbling in his wake like red straw. On the rise, the Wizard Champion followed his enemy's advance with a cold, secret smile. He closed his eyes and gathered his will. Writhing green and orange runes gnawed at the edge of his mind as he prepared the way for power, but he denied their siren call of madness. Ready, the knife edge achieved, the path chosen, his eyes snapped open. He raised his arms and began to chant. The Champion of Tzeentch finally broke through the hordes of Nurgle. Now no-one stood between him and the Wizard. He started up the rise and was suddenly crippled by the heat of a debilitating fever. He staggered to a halt and fell to his knees, axe dropping from sweaty hands. Too weak to resist, he watched in helpless horror as the Wizard closed to deliver the death blow. This spell creates a 6" radius Miasma of Pestilence around the caster. Any other model inside the zone has all the characteristics on his profile reduced by half. Round fractions up on the D6 score of a 4, 5 or 6 and down on the score of a 1, 2 or 3. This does not affect Daemons, Champions, or Beastmen of Nurgle. The Miasma of Pestilence lasts until the caster is wounded, when it is immediately dispelled. The Stream of Corruption is a stinking jet of putrid blood, pus, maggots, slime and other foulnesses. 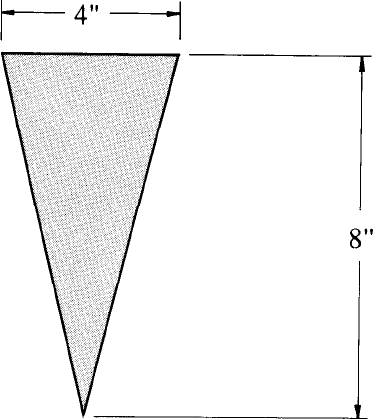 It forms a triangle 8" long and 4" broad at its end, as shown on the accompanying diagram. Make up a Stream of Corruption template to the design shown using card or paper. When the spell is used the template is positioned over the targets. Each model within the template must roll a D6 and consult the chart below. Models with high initiative characteristics stand a good chance of diving or ducking out of the way of the Stream. Other models are less lucky! Models which are unable to move for any reason are choked automatically. A Greater Daemon of any kind is not automatically slain on rolling the appropriate D6 score, but sustains D6 wounds instead. The Plague Wind may be cast against any target unit within 24". It is accompanied by wind-carried moaning, insane laughter, and other sounds of death and delirium. Each model in the unit must test for Nurgle's Rot. The unit must then take an immediate rout test. Kalem Tarnel Champion of Tzeentch, struck the head from the last of his adversaries. The creature's body fell to the floor and the leprous leathery orb rolled to his feet. His Warband gave a cheer and raised their swords in a proud salute of victory. The severed head glared at him malevolently with its single eye. The head bore no nose and a single horn grew from its pustulent forehead. Its teeth chattered strangely, as if unwilling to accept the biological inferences of sudden decapitation. "The Warband of Gorak Champion of Nurgle is no more!" he cried. His followers cheered again. A small cloud of flies began to gather around the severed head. The long fingers of Gorak Champion of Nurgle twitched spasmodically. His eyes fluttered open, and he saw Kalem Tarnel, his most hated enemy. He tried to move, but found he could not because the sword wound in his side hurt so abominably. Kalem Tarnel had left him for dead. He hadn't been far wrong either. Gorak smiled to himself and his fingers twitched again, but this time with purpose. He moaned softly as the power flowed through him. The unexpected blast caught Kalem Tarnel's cloak and pulled him to the floor. The rest of his Warband failed to keep their footing and fell into a formless spluttering heap. The severed head rolled off, followed by its entourage of insects. Gorak had summoned a Plague Wind with his dying breath. It was both his final act and a parting gift to his old enemy and rival Kalem Tarnel. The wind howled like a banshee, driving something that tasted like bone dust into the eyes, ears and mouths of the Tzeentch Warband. A rumbling laughter filled the air, like the bellowing of some huge, enormously fat, but companionable old uncle. The spell passed over them one by one, catching the unlucky, missing others, and eventually fading with the wind itself.